The SteelMaceWarrior.com podcast is all about sharing the stories that led each warrior to the art of Steel Mace. While we gather knowledge from experts in this field and their journey's, I hope that it might help you discover the warrior within you. Today we have the first duo podcast and returning guests: Frank Dimeo and Valerie Pawlowski. We talk about women enthusiasts and coaches in the mace industry, go a little more into MaceFit and MaceFest (the first ever all mace event). Today we speak to Eric Doyle, owner of the Long Beach Kettlebell Club, founder of Unconventional Athlete and Kettlebell Sport 2x World Champion. We discuss his journey using unconventional tools such as the kettlebell, steel maces and bulgarian bags. From losing weight to being in a major accident to starting his gym Long Beach Kettlebell Club in Long Beach,CA. This is an episode you'd want to listen to. Join me as i have a chat with Erik Esik Melland - Former Onnit Steel Mace Master Coach, Viking Ninja CEO and Author of Viking Ninja Elements -Kill your ego, Challenge your discipline. We speak about his journey with the steel mace, his new book "Viking Ninja Elements" and his latest fitness training system called Viking Ninja along with other thangs mace. In this episode i talk to Kim Fox, She works full time in the Army, is a Kettlebell Champion and is also owner of Fox Fitness. We talk about what is success, setting goals, making sacrifices and developing the entire warrior. This episode is really a gem and i am so very glad it was the ending to season 1 of the Steel Mace Warrior Podcast. We talk about Summer's story, how she is inspired by the art all around her including her performing friends from the Circus and of course, we also talk about using clubs and maces with Yoga. Meet Valerie Pawloski, world champion in Kettlebell Sport & Team USA 3-Time Gold medalist. We talk about her story, the rediscovery of many lost fitness modalities, mace safety and strength training from a super woman's perspective. Join us as we talk about John's story and as we gather some great mace knowledge. This episode is interesting because unlike other coaches John started training in the highland games before touching a mace! Don't know what that is? No worries we discuss that as well! In this episode of the Steel Mace Warrior Podcast i speak to founder of MaceFit and owner of The Cave, Frank Dimeo. We hear his story, speak about using Clubs and Maces TOGETHER to build incredible functional strength, we talk about the Mace Fit program and much more! In this episode i have a mind blowing conversation with Coach Paul Gray from Firepower Gym and Co-Founder of the Art of Functional Movement. We talk about his story, how to prevent and get out of injuries and putting some time in the trenches. You will see what i mean! In this episode i speak with Pake McNally, found of Become Stronger. We talk about his Indestructable WarClub / Hand-Crafted Mace, his amazing story and why he started Become Stronger. Wonderful man who hand makes grungy imperfect but yet beautiful maces! Don't miss this one. It's a pretty amazing episode and you are going to want to get your hands on a warclub, hands down. Feeling the Effect and Moving Number of the Mace with NewBreed MaceBell - Episode #14 Finally a duo episode on the Steel Mace Warrior Podcast! We have Lily Orozco and Daniel Ramsay from NewBreed MaceBell. We talk about their individual stories, how they met and came together to start the NewBreed headquarters and programming. Let's just say they delivered! Don't miss these two inspirational coaches on episode 14. Giving the mace time and staying true to yourself with Coach RT3. In this episode i talk to Coach RT3 about his extraordinary story which includes personal transitional moments. From Thailand back to San Francisco. He shares his mace knowledge – when you need to set the mace down, give it time and staying true to yourself and what you believe in. Lot’s of golden nuggets inside this episode. Look out for them! Join me as i talk to the second WOMAN WARRIOR on the Steel Mace Warrior podcast named Kelly Manzone. She is a Wife, Mother, Fitness Professional and Unconventional Athlete that will be sharing her experience in kettlebell, mace and mobility. Specifically we talk about her story with coming back strong from a Colitis condition, exploring the fitness world rather than to stay black and white with training,how you can swing a mace better with stick mobility prep and so so much more. Can't wait for you to give it a listen, IT'S A MUST. Plus Kelly is kind, highly knowledgeable and plain out cute buff. Don't miss out. In this SMW episode we talk about why people seem to love the steel mace (our theory on it being encoded in our body) , the yin and yang concept to mace, some mace history and so much more! Zack is full of mace knowledge and he pours it out on this episode. If you are a mace warrior don't miss this one. Join me as i talk with Pawel Widuto, Head Coach of House of Tengu and Co-Founder of Art of Functional Movement. In this episode you will learn more about Pawel and we talk about seeing the mace as one piece of the puzzle & his thoughts on it's main benefits, we also talk about the Art of Functional Movement elements (water, fire, air and earth) and how everything in life is an art (hint: even your mace). Make sure to give this episode a listen IF you are a true warrior! In this episode, i speak with Don Giafardino, the owner of Adex Clubs and Maces. We talk about his story which includes a shoulder injury he suffered with for years and how he took action with clubs and maces as an alternative to pills and surgery. And we talk about his awesome adjustable mace idea and the story of why he invented it in the first place. 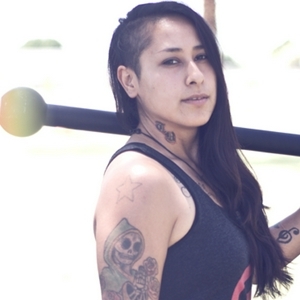 I love to put a face on the companies behind the warrior tools and this is it! Let's get our Viking Strength Foundations down! In this episode i talk with Coach Vaughn from the Viking Valhalla Training Center in Palmdale, CA. Also known as Coach Vaughn on YouTube with over 3000 subscribers and anywhere between 7-9 K views on most of his Steel Mace videos, why wouldn't i have him on? He rocks educating people online and i wanted to personally learn more about him and what he is up to. We talk about the synergy between the Steel Mace and Kettle bells, his awesome e-book named Gada Swing (which is available right now, link below), working out bare foot and much more! Don't miss this one, your gonna love it. In this episode, we are changing the mood by speaking with Tyler Valencia, President of The Kinesiology Institute for Performance Specialists (KIPS). KIPS provides a great online course and several workshops a year specifically about Steel Mace which i thought you would love to hear about if you are a personal trainer or coach! For all of the fitness enthusiasts and steel mace fans, we also talk about all sorts of other Mace related topics that i know you will enjoy. Got you covered too. Let's see what Tyler has to say about this amazing piece of equipment /fitness tool/ weapon. ALERT! The podcast episode order and # we're flipped. So you'll hear me say episode 6 but this is actually episode 7. There was a slight delay on the release of this podcast episode. Apologies for any confusion. Join me as i talk with Leo Savage about flow as an expression and diving deeper with the Steel Mace. Join me as i talk to the famous (59 year old) Mr.Maceman. We talk about his story, "Traditional" competition style mace training, mace unity and several other steel mace training topics. 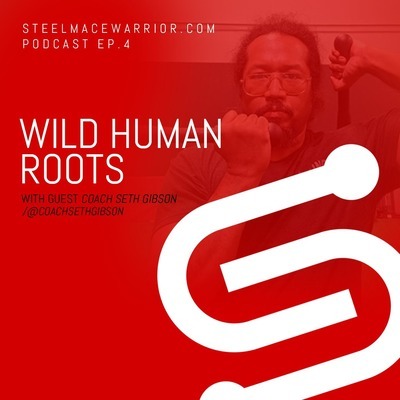 Listen along as we talk about Seth's Steel Mace story, using Steel Mace as physical therapy and going back to our wild human roots. She is a warrior at Flow and she Flows so damn beautifully! 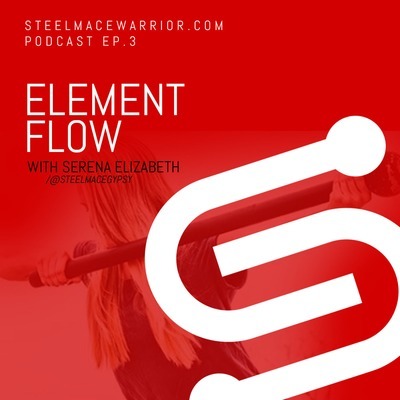 In episode #3 we talk about "Element Flows" with special guest (and first woman warrior on SMW) Serena Elizabeth AKA Steel Mace Gypsy. Learn about the woman from a small city in Arizona with nothing else to do but to experiment with unconventional fitness tools/equipment in times of lows and highs. Join me as i speak with CPPS Strength Coach & Steel Mace Coach Matt Berbary from Dat Strength about using the steel mace for strength and we can even use the steel mace as medicine for the mind, body and spirit.